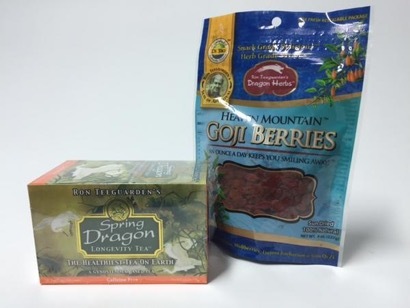 1 Dragon Herbs Goji Berries 8oz. Bag. 1 Dragon Herbs Spring Dragon Longevity Tea, Box of 20. Goji berries are a "high-ORAC" antioxidant-rich superfruit featuring important phytochemicals such a beta-carotene, zeaxanthin, betaine, polysaccharides (LBPs), trace minerals and vitamins. Spring Dragon Longevity Tea™ is a delicious herbal tea composed of the most famous tonic herbs in the Orient, all of which are renowned for promoting a long and healthy life. The main herb is Gynostemma, a green leafy herb that is consumed throughout Asia to promote overall health. Gynostemma has a strong anti-fatigue effect. In Asia, it is consumed by tens of millions of people every day, often in place of tea or coffee. These two health tonics go so well together that we had to offer them as a set!